On Friday a third team of 7 HSBC Private Bank staff spent the day helping out at the GSPCA. Once again the group arrived just after 9am where they were greeted by Tim Pellett GSPCA Community and Training Officer who after a quick safety briefing got them off to work around the site helping clean, tidy, garden, paint and care for the many animals at the Animal Shelter in St Andrews. 7 staff from HSBC Private Bank helped on Monday, 10 on Wednesday taking the total last week to an amazing 24 staff having helped at the GSPCA. Yesterday a second team of 10 HSBC Private Bank staff spent the day helping out at the GSPCA. 7 staff from HSBC Private Bank helped on Monday taking the total this week to 17 and a third group arrives tomorrow to help at the GSPCA. Yesterday a team of 7 HSBC Private Bank staff spent the day helping out at the GSPCA. The group arrived just after 9am where they were greeted by Tim Pellett GSPCA Community and Training Officer who after a quick safety briefing got them off to work around the site helping clean, tidy, garden and care for the many animals at the Animal Shelter in St Andrews. All of the HSBC Private Bank staff were an amazing help and from all of the GSPCA a huge thank you to them for all they did. On Saturday a team of staff from Source Recruitment arrived at the GSPCA to help around the Animal Shelter in St Andrews. This is the second time their wonderful team have helped and the GSPCA are extremely grateful to Source Recruitment as not only did they do a great deal to help at the Shelter but they are also a Silver Angel Pen Pal Sponsor and so help support the many animals in our care. This month once again at the GSPCA we were lucky enough to have help from KPMG staff. The team of 13 on the 9th August and the team of 8 on the 16th August staff from KPMG arrived at 9am where they were greeted by Tim Pellet the GSPCA Community and Training Officer and after a short induction were set to work around the site at the GSPCA. 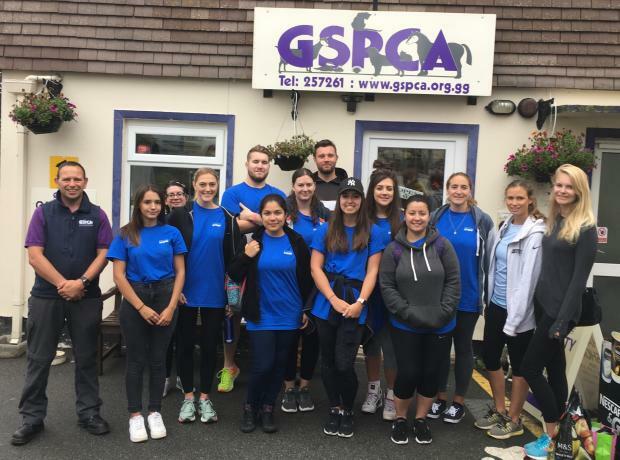 Last Thursday 8 volunteers from the Aon Insurance Managers (Guernsey) Limited (Aon) spent the day helping at the GSPCA Animal Shelter in Guernsey. From the GSPCA and all of our team we would like to say a huge thank you to the Aon staff for all of their help. On Tuesday 19th June Northern Trust staff came for their third volunteer day of 2018. Over the previous four years 125 volunteers from Northern Trust have helped out at the GSPCA, with 38 staff helping in 2014 and a further 26 helping in 2015, 34 in 2016 and 16 in 2017, 11 earlier this year and additional 9 last week taking the total to 134.